For cruise ship passengers or Cayman Islands visitors seeking a truly exciting and unique experience our Wave Runner / Jet Ski Tour to Stingray City or Stingray Sandbar is the ideal excursion. The Tour begins with free shuttle service from the Hard Rock Café in George Town (a short walk from the cruise ship terminal). For our guests staying on island, we offer free shuttle service from any hotel in the George Town or the Seven Mile Beach area. After guest pick up en route to the wave runners our guests can enjoy a comfortable air conditioned ride with a knowledgeable and entertaining driver. Before departing to the Stingray City or Stingray Sandbar our guests are briefed on safety procedures and given a lesson on how to safely operate the wave runners. Complimentary water and snorkeling gear is provided. 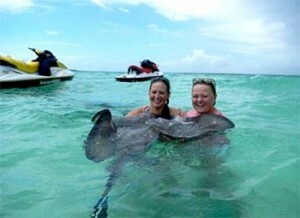 Once out on the beautiful Caribbean waters, the Stingray Tour takes 2 1/2 hours to complete. The tour includes a visit to Stingray City Sandbar, where guests are able to interact with Southern Stingrays. This one of a kind, unique experience is followed by reef snorkeling, at a less traveled and very beautiful location, and a tour through the mangroves (Cayman’s natural wetlands) on the way back to the dock. Afternoon tours can be extended to 3 ½ hours minimum to include a beach bar/restaurant stop. Please note: This is a physical activity!